A simplified take on RPG combat inspired by classic games like Sword of Hope and Dragon Warrior. 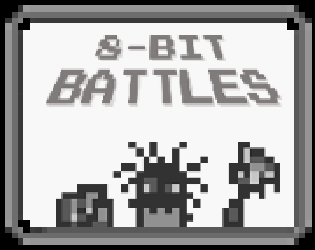 8-bit Battles captures the feeling of exploiting enemy weaknesses and leveling a character without having to micro-manage stats. It's perfect for anyone who wants the flavor of an RPG in the amount of time it takes to ride the train to work. - No scary clowns, giant lobsters, or singing pigeons. - Tap an action to select, then tap an enemy to attack. - Enemies attack more frequently when the screen is full, so focus on eliminating them as quickly as you can. - Enemies only have a few hit points, but your attacks do only a few damage. To maximize efficiency, try learning each enemy's elemental weaknesses. Some of them give you a clue if you tap and hold on their icon. You can also listen for the "swish" sound, which indicates an effective attack. - Your XP bar also serves as a HP gauge. You gain XP by killing enemies and using all of your attacks. You lose it when enemies attack you or you use the manual attack refresh button. - Fill the XP bar up to gain a level, unlocking new items and new enemies!